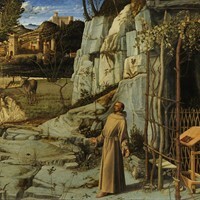 A typically innovative example of Venetian painting by Giovanni Bellini, one of the greatest Old Masters of the Italian Renaissance, The Ecstasy of Saint Francis (or St. Francis in the Desert) - a private commission for a domestic setting - depicts a scene from the life of St. Francis of Assisi (1181-1226): possibly the moment he received the stigmata, in 1224. Executed in oil and tempera on poplar panel, the work is important for two reasons. To begin with, it is one of the first Renaissance paintings of stigmatization in which there is no sign of a seraph (angel or crucifix emitting rays). Second, it illustrates how Bellini combines the realism of Netherlandish Renaissance art, with the spatial depth of the Florentine Renaissance and the glowing colour palette used in both Venetian altarpieces and Venetian portraiture. See also: the difference between Colorito and Disegno. Giovanni places St Francis in the (theoretically less important) lower right of the picture. He depicts the saint barefoot and dressed in a monk's habit as he emerges from his cave-like sanctuary to greet the day. His arms are spread wide and his head is thrown back as he looks up to the sun. The ecstasy he experiences as he looks up to the heavens, derives - we assume - from receiving the stigmata. (Note: The stigmata, signs of the wounds inflicted on Jesus during the crucifixion, are reputed to have miraculously appeared on the hands and feet of St Francis while fasting on Mount La Verna in 1224.) But as mentioned above, there is no trace of any Christ-seraph, which was commonly present during stigmatization: see, for instance, Stigmata of St Francis (1487, Pinacoteca Comunale, Castiglione Fiorentino) by Bartolomeo della Gatta, and Saint Francis of Assisi Receiving the Stigmata (1430-32, Philadelphia Museum of Art) by Jan van Eyck. This latter work was in Venice for a few months in 1471, and was undoubtedly seen by Belinni as he copied the strata of the rocks in it and used it in his own version. Faint wounds are discernible on the palms of his hands and on his foot, but above all it is nature and the landscape that dominates the scene. A shepherd and his flock of sheep (background) are also included, as well as a grey heron and a donkey (middle-ground), and a rabbit (just below the saint's sleeve), in order to symbolize St Francis's love of animals. The painting is infused with a soft warm glow, which reinforces the idea of man and nature in harmony. Giovanni Bellini was not comfortable painting the complex allegories or Classical subjects favoured by his brother-in-law Andrea Mantegna (1430-1506). Instead - as a shrewd operator in the market for devotional paintings that was particularly strong in the conservative society of Venice - he played to his strengths. For the cultured nobility he painted top-quality landscapes, at first introducing a glimpse of a view behind sacred figures, later - as in the St. Francis - immersing them in it. For the less appreciative lower levels of the market, he trained the apprentices and pupils of his large workshop to produce endless variations of his serene compositions of the Madonna and Child. Thus in the Ecstasy of St Francis Bellini plays down the stigmata themselves, and dispenses entirely with the rather contrived Seraph symbols. Instead, he imagines the saint in prayerful ecstasy. The figure of Francis is deliberately made small in relation to the format, absorbed within God's creation. Bellini uses light to signal the reception of grace. The foreground of the picture - the place of penitence and meditation on Christ's Passion - is dominated by a cool bluish-grey, while the saint and the distant landscape are warmed by the rays of the sun. The meaning emerges from the play of difference - cool and warm, barren and cultivated, bare and leafy. Behind Francis is his humble cell. Together with the Eucharistic vine above and the sepulchre-like cave behind, this side of the painting evokes the death of Christ on Good Friday. The left side, by contrast, evokes Christ's rising from the dead at Easter: the sunlight, as it emerges from the clouds at the top right, inclines the laurel tree - token of Christ's victory over death - towards Francis, as if in acknowledgment that the saint was another Christ. This panel painting features several other symbols and motifs, often used in Flemish painting, involving plants, animals and other objects, which allude to Franciscan ideals of poverty and humility. They include: a skull (on the top of the saint's reading desk) which not only evokes Golgotha but also represents the transience of human life, as compared to the eternal nature of God; the stream (left middle-ground) is intended to symbolize Moses and the great spring; the bare tree (centre) probably represents the Burning Bush; while the juniper shrub signifies chastity, and the grey heron symbolizes penitence because of its ash-coloured plumage. Meantime in the distance we can plainly see the still-empty Heavenly Jerusalem. The Ecstasy of St. Francis, like Bellini's Portrait of Doge Leonardo Loredan (1502, National Gallery, London), is a wonderful example of his style of painting. His eye for detail, for instance, and his meticulous life-like realism both stem from the works of Flemish painters like Jan van Eyck (1390-1441) and Roger van der Weyden (1400-64). His skill in creating the illusion of three-dimensional 'depth' or 'perspective' in the picture plane, comes from his knowledge of Italian Renaissance art in general, and the work of Andrea Mantegna, his brother-in-law, in particular. Lastly, Bellini's Renaissance colour palette is typically Venetian in its lustre. See the rich colours of Bellini's San Zaccaria Altarpiece (1505, Church of San Zaccaria, Venice). See also: Titian and Venetian Colour Painting (1500-76).  Expulsion From the Garden of Eden (1425) Brancacci Chapel, Florence.  Annunciation (c.1450) San Marco Museum, Florence.  Flagellation of Christ (1450-60) Galleria delle Marche, Urbino.  Lamentation over the Dead Christ (c.1470-80) Pinacoteca di Brera, Milan.  Virgin of the Rocks (Madonna of the Rocks) (1483-5) Louvre, Paris.  The Last Supper (149598) Santa Maria delle Grazie, Milan.  For the meaning of other Venetian Renaissance paintings, see: Homepage.